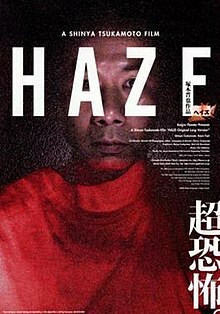 Haze (ＨＡＺＥ ヘイズ) is a 2005 Japanese thriller/horror film written and directed by Shinya Tsukamoto who also stars in the movie. After appearances at several international festivals in 2005, the film debuted theatrically in Japan on March 4, 2006. Two versions of the film exist: the original release, a short 25 minute version; and what Director Tsukamoto entitled the "Long Version", which runs 49 minutes. A man wakes up in a small concrete space bleeding from the abdomen. He can barely move and has no recollection of why or how he came to be there. Crawling forward he eventually meets a woman and they try to piece together their past lives. Haze was also released on DVD in Germany on October 2006. This page was last edited on 11 October 2018, at 14:01 (UTC).